Have you ever noticed what it takes to make a whole? Well, of course, it takes every part to make a whole. What I am asking is do you realize what that means? Have you realized how that applies in your own life? It applies in the life of every family, every city, every church, every state, every country, every group. Think of a group like a car. To have the very best quality, best looking, and best working car it takes good parts and in order for that car to be complete it must have every part in order and at it's best. Every detail of every part determines how the whole will be. If we put lots of bad parts, together then the car will be bad in one way or another. If we just leave that part out then something will not work or it won't be quite right or even a bit boring. There may be some parts that can be expendable to a certain level but in truth the whole will not be complete and definitely not perfect. It doesn't matter if it is the part that is on the front or the back, top, or the bottom, outside or inside...every single part has to be there to make a perfect whole. It sounds pretty simple doesn't it? It should be simple but so many of us just seem to forget that. Part of being my best is being clean and shiny, not letting the muck of life change my attitude and not letting myself get into slinging muck on others (you know gossip and slander) I also need to make sure that my focus is in the right place so that I don't run astray. It takes a unified vision in order for a group to get somewhere. First that group needs to agree on that vision and then that group must cooperate in order to reach that vision. It also means that we must stay focused on that vision and not get sidetracked. Getting sidetracked can cause all kinds of problems and it costs valuable time and energy. If a group wants to run with the best then it needs to be the best and that takes hard work. It also takes perseverance and hope to get the group past the hard parts. There are always going to be hard parts to get past because that is just the way it works on this Earth. The good news about that is that when we get past those hard parts then it really feels good. There is just something about that feeling that comes with hard won victory that gives satisfaction. We must not get so focused on the vision that we forget history. History has it's part too. It teaches us. If we refuse to learn the lessons of history then we are doomed to repeat our mistakes. When we honor history by learning those lessons then we can continue to move forward. We must think before we move. If we just head out in some direction without thought then we might end up broken down, out of gas (energy), or lost. In order for a group to arrive all in one piece then it must work together and think together. In order for that to happen the group must agree. Disagreement causes friction and friction slows things down. Enjoy the trip! Yes, the arrival is great but the trip can be great too. Even when things seem to be going wrong. Work on making things right but remember to enjoy it too. Remember it is the trip to a goal as well as the arrival that makes it most memorable. Try to make that trip as pleasant as possible. One speed is not really the best. We need different speeds for different parts of the trip. When it is a straight road then the speed can be fast but when there are curves we need a slower speed so we don't end up off the road. Sometimes the speed slows down because we are going uphill. When we go over that hill we need brakes to slow us down so we don't end up in a heap. Newer is not always better. Sometimes it is just different. There is something to be said about maturity and staying power especially when those hard times come. We don't want to be so quick to get rid of our older parts that we dumb down the whole to immaturity. Remember every part has it's place. There are always going to be a few extremes but if the group will stay centered onto the goal then the extremes can be helpful. They let us know the boundaries, they keep us from getting too boring, they also help us to see other ways of looking at things. They heat things up and/or cool things down. They have a part if we will learn to put them in that part. Before a river starts to roll there will always be a few streams that seem to be going their own way but when the river truly rolls those streams become part of the whole. We shouldn't try to eliminate the extremes, we need them. In every group there are going to be visionary trail cutters, pioneers, and settlers. We need each of these too. The visionary parts of a group help us to see what can be (They are the ones that are always looking at the next goal and planning). The pioneers help make it happen (they are the ones working and in the big middle of the project) and the settlers (sometimes called stragglers) help us see what needs to be done in order to finish perfectly (they are the ones that seem to be critical of the project or they refuse to move on to the new one) Instead of getting frustrated with each one...utilize them in the very best way. Put them in a job that fits their part. How frustrating to be a settler and be expected to cut the trail and make a map especially when you are someone who is always looking back. It takes a visionary to do that part. I tend to be a visionary person, I love to plan it and even help build it but I am pretty terrible and miserable at maintaining. It takes a pioneer or settler to do that part. We need every part. There is room for every part to be successful. (I am not talking about soccer mom mentality where everyone gets a trophy no matter what their effort) When we get into a group we tend to get competitive. Some competition is healthy but so many times that competition means that there can only be one winner (One person who takes the trophy for the group) It can also mean that some get thrown down and out so another can climb over them. It doesn't have to be that way. That is not perfect. Perfect is when all the parts come together to make a perfect whole. Teamwork with team rewards along with individual recognition. That is the very best group to be part of. One other parts that would be easy to leave out is beauty. Beauty is not just surface. Beauty can be on the outside and the inside. It is so beautiful to see a group work together. Some of my favorite basketball games to watch were the ones where the team worked and got into a groove where everyone did their part, everyone worked harder to take up the slack when someone lost the ball or missed the shot or got hurt. It isn't that they played perfect but they did play beautiful. They had played together as a team for so long that they knew the response their teammate would make in any given situation and they responded in a way that would be good for the team. They were imperfect people who played an imperfect game but despite that it was beautiful. The beauty came from the way the team worked together. Beauty can appear in many ways. Embrace that beauty. Let it surface and let it penetrate to the depths. Look for it. Hope for it. Let it happen. Sometimes a bit of ugly appears. Learn from it but don't let it take over. Even ugly has it's part. It happens when things aren't quite right. when it happens, look around and find what needs work. Use it for positive change. Reflection is an essential part too. When in the midst of trying to achieve a goal as a group or an individual it is easy to get lost in all the details. That is when it is good to step back evaluate and determine if a course change needs to happen or if the previous course is correct. Remember the rough parts are good too just like the shiny parts. Sometimes the people who help us become more beautiful the quickest are the very ones who grate on our nerves the most. I know how hard it is to stand under someones criticism or mean acts. I have found that when I rise above it and continue to do right even under those circumstances then it shapes me and perfects me and becomes a stepping stone up or I can let it be a stone on my head that pushes me down. The thing is that it is my choice which it will be. This post is not meant to be an exhaustive list of the parts present in a whole. It is only intended to highlight how each part even the (seemingly) negative parts are important. I hope that when you are in the midst of a family saga, a church meeting, or a political debate, or a group of any kind that you will remember this. We need each other. It also gives meaning to the quote, "The whole is greater than the sum of it's parts". Every part when it comes together and does it's part right will then it make a wonderful whole that is beyond what the parts alone can achieve. 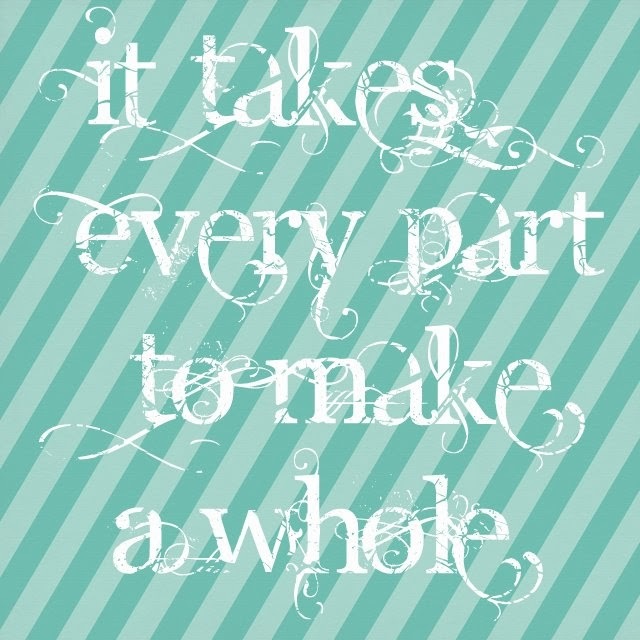 It takes every part to make a whole. Do you see that statement differently now? I hope it also helps you to appreciate the other parts of any group you are part of. I hope it helps you to rise above, look beyond, learn the lessons, and celebrate the parts as well as the whole. All the photos for this post were taken at the 2014 Cruisin' The Brazos Car Show in Seymour, Texas. I hope you enjoyed them.